The Fair Debt Collection Practices Act (FDCPA) is a code of conduct for debt collectors. The FDCPA protects consumers in debt from harassment by debt collectors but debt collectors still violate people’s rights and still harass their targets. People need to know their rights against debt collection to feel their protections but many people are ignorant of them. Many debt collectors violate the rules and regulations because they assume that people won’t know their rights in terms of fair debt collection and, sadly, more often than not, they are right. The FDCPA states that people can defend themselves if they know their rights which, long term, would help save an individual from court. The act more specifically protects consumers who are ignorant of these rights that protect them. These rights include that creditors cannot: send letters to or call your friends, family or employer, threaten you with filing a lawsuit, threaten arrest, send someone to speak with you or your family, threaten to garnish your wages, threaten to repossess your furniture, clothes, jewelry, etc., threaten to call a social worker, use offensive or demeaning language, call late at night, early in the morning, or numerous times during the day. A person cannot waive these rights granted to them. It is odd enough, however, that these are some of the things creditors are known for doing. Debt is a stressful enough thing without collectors being shady about their collection practices. Those who owe a debt are usually focused on paying it back and debt collectors only add to the consumer’s problem. As stated above, the Act is set to protect consumers from debt collectors but the debt collectors know this, it is their job to know this and they sometimes will use this. Debt collectors know that consumers are, more often than not, ignorant of their rights. I, like many others in this country, have heard crazy stories about debt collectors. I have personally heard stories of them calling people and threatening violence if the debts are not paid as well as using vulgar language and, of course, the always popular, “you don’t wanna know what will happen” type threats. The widely unknown truth is that these collectors cannot do or say these things. 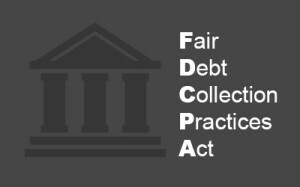 In fact, if a consumer was to take action against these violations to the FDCPA, they would probably be able to pay off the debt that the collector was harassing them for much faster than expected. I hope for anyone who reads this that you get a warm and fuzzy feeling the next time a debt collector tries to harass you. If you are experiencing these types of violations from debt collectors, begin keeping note of the violations and calls then get a consumer attorney that is available in your area to assist. A consumer may not record a call from a debt collector but the calls are always recorded on their end for consumer purposes, for example: a lawsuit.